A new species of giant frog has been found near Lake Conn in County Mayo. The newly discovered species has somehow gone unnoticed for centuries, possibly due to its relatively small catchment area and exceptional camouflage. 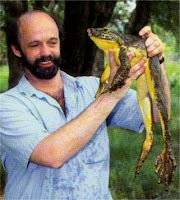 The frog was found by John Edwards (pictured across with the giant frog), a zoologist from NUI Galway, while carrying a preliminary survey of frog spawn in the area. "I never expected to see such a specimen here", Mr Edwards declared. "It's hair raising stuff". Ironically, Mr Edwards has very little hair. The frog is very similar in size to the Goliath Frog and it has been named Rana biffous, after our Taoiseach Brian "Biffo" Cowen. For more on this story, click here. Naming that frog after the Taoiseach seems a tad risky. I hope it doesn't spawn any problems for Mr. Edwards! Keep up the good work, loving the blog! Loving the spawn pun! Puntastic! You mean you only spotted one of my puntastic puns?? Got the "tad" pun now! Puntabulous! I'm a bit slow these days with a lack of solid academic thinking! Teaching is slowly wearing me down! Loving your blog by the way - particularly enjoyed your article on GM potatoes - used in class with my VI form ag science pupils!